…it’s goat to be good. And that’s exactly what this is: Goat. I mean good. 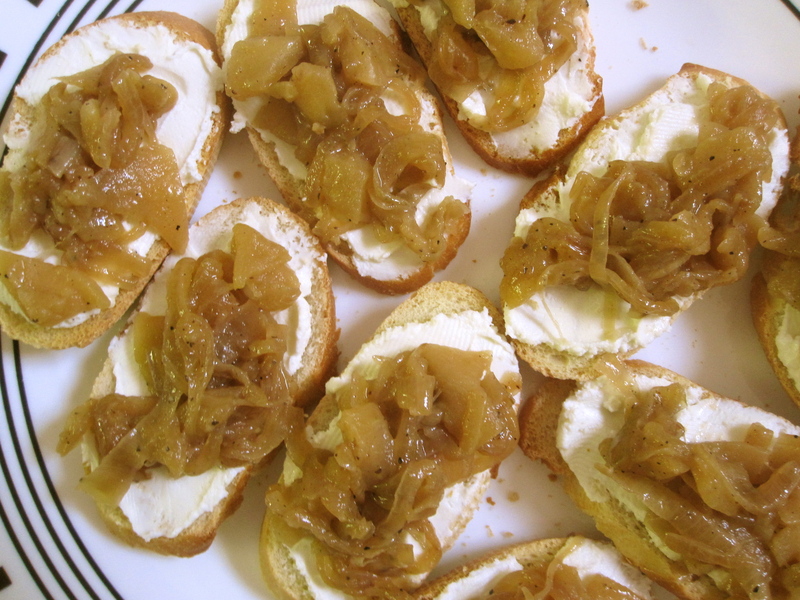 It’s goat cheese crostini with apple-onion chutney. Start by toasting baguette that has been thinly sliced on a bias (yes, on a diagonal. I knew you knew that). While the bread is working in the oven, leave the goat cheese out to soften. Now, get started on the onions. Slice them thinly and brown on medium-high heat in canola oil. Season with S & P (you know the stuff). While that’s happening, peel, core and thinly slice the apples. Reserve them in a bath of water and vinegar so that they don’t turn brown and gnarly. Once the onions have developed a nice deep caramel color, reduce the heat to medium-low, add the apples and a small knob of butter. Continue cooking until the onions and apples are soft, stirring occasionally. Remember that bread? If you haven’t burned it at this point, slather each slice with goat cheese and top with the chutney. We’re playing with contrast in this dish. The crunch of the crostini is the ideal base for the creamy goat cheese and soft chutney. The vinegar used to keep the apples from browning adds a subtle tart flavor, which works with the sweetness from the onions and apples. Not sure about you, but caramelized onions always make me want to get naked.